I think I’m kind of an emotional creature. Scratch that. I’m definitely an emotional creature. But this is not a bad thing. God created emotions, and he has big emotions for me. I like having big emotions. I like loving deeply. I like laughing heartily. I like being ridiculously excited. I love superlatives. But sometimes my emotions become a jumbled up mess. Mix big emotions with a tendency toward introspection, and presto I see a thousand strands of spaghetti interwoven and tied in knots with each other! I think we’ve talked about this topic before? Probably so. Anyway, one thought affects another. That one affects five more and so on. Untangling them seems daunting, impossible, and futile. I mean why would you ever want to untangle spaghetti anyway? Well, I suppose it’s there the analogy breaks down. But nonetheless, those days and weeks come. The knot grows until the burden of untangling it seems so heavy it’s crushing. Anybody else relate? Can I get an amen? For me at least, big conflicting emotions are one way God reminds me of my neediness, and that he is enough to meet those needs. They teach me to preach truth to myself even when I don’t feel like it. And I learned long ago, that if I keep hearing enough truth, my emotions will surely catch up. Duh. Why didn’t I think of that? It’s something I totally know, but I had to hear it from someone else. Many of us struggle to be still, myself included. We tend toward Marthaness and not Maryness. Yes, I possibly just invented two words. And if you have no idea what I’m referring to, go check out Luke 10. But being still is one of the themes of this year. I’m still learning it. When I really stop, sit down, cry to God for help, and physically write out what is true, He is ALWAYS faithful to meet me there. He is always faithful to make truth sink in! It’s the Holy Spirit who illumines. He is truth. And He’s the one that untangles the knot. But that’s enough discourse on my thoughts and emotions. Enough metacognition. Let’s get to the good stuff. Over the last few days God’s been using John 17 to distill the thoughts and smooth out the snarls. Enter, big excitement! I am dying to share this with you! This is staggering stuff. Jesus’ imminent return to the Father was close at hand. Suffering and death was coming. Ending his sermon, he started to pray. Yet it wasn’t a silent conversation with his Father. He wanted the disciples to listen in! And now we get to listen in. There’s so much rich theological truth happening in this chapter, but it was five words that utterly blew me away. Do you recognize what just happened here? Jesus is praying for his church. And as part of his church, Jesus is praying for me! for me? 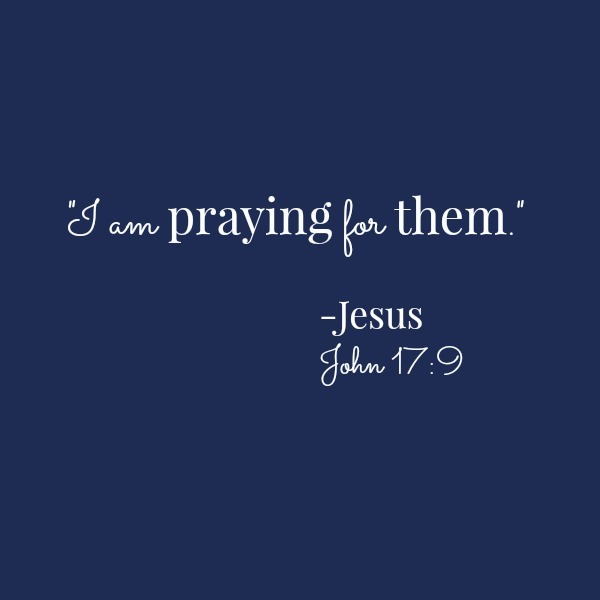 “I am praying for them. I am not praying for the world, but for those whom you have given me, for they are yours.” (v9) Let the full weight of those words wash over you for a second. Don’t miss the significance here. Staggering right? Jesus, King, Messiah, Savior, Lord, Son, God, is praying and I get to look over his shoulder. Seated at the right hand of the Father, he pleads for me. He always lives to make intercession for his own. (Hebrews 7) Here I get a glimpse of the way he talks to the Father. About himself. About his church. About me! Holy stars and stripes batman! And just what does He pray? Sanctify them in the truth. Transform them. Teach them that you love them as you love me! I desire them to be with me. Bring them where I am! Help them know that I am in them and they are in me. Keep them. Guard and protect them. I know there’s so much more implied here, but for me this week, the link was to my thoughts. “Do not be anxious about anything, but in everything by prayer and supplication, with thanksgiving, let your requests be known to God and the peace of God which surpasses all understanding will guard your hearts and your minds in Christ Jesus. (Philippians 4:7) When I cast my jumbled up worries, fears, anxieties on Christ, the result is peace. Peace that cannot be understood. Because he already died for those sins, Jesus guards all of me. And if that’s not enough, just think about some of the other gigantic implications of this prayer. Jesus shows deep, personal, intimate care for his own. He knows we’re sheep. As the great shepherd, he protects and lays down his life. He also prays that we know we are in him and he is in us. Therefore, I am never alone. There is never a moment when Christ is not fully aware of my needs, struggles, and fears. He gets it, even when I think no one else does. Because he’s also God, he knows exactly how to pray for me. I can’t get over that he actually does, nonetheless perfectly! Wow. I admit, union with Christ is something of a beautiful mystery. It’s easier to get that he’s in me. But I’m in him? Still contemplating that one. Likewise, because I’m part of his church, part of the bride, he desires me to be with him! And he sees me with affection and delight. It means I’m wanted. Always. The way he prays reveals resounding oneness with the Father. It also reveals that he wants his own to know the same intimacy. Because Jesus satisfied God’s wrath, he accomplished that for me.Therefore, God loves me with the same love with which he loves the Son. That’s almost crazy talk! But it’s true. And, let’s not miss what he doesn’t pray. He does not ask for believers to be taken out of the world, to withdraw from it, to create fortresses around ourselves. Also, “not of the world” isn’t a command. Rather it’s an indicative, already a reality. Believers are already not of this world because of who we are in Christ. But he doesn’t ask for us to be removed from it. He does not ask that his followers would have a life of ease and that everything would be tulips and mint-chocolate-chip ice cream. He does not pray for us to have health, wealth, and prosperity. He does not pray that we would squabble over peripheral issues. Rather he prays that we would know the unity he has with the Father. He does not pray “show them that they earn favor with their toiling. Show them that you love them more or less because of their actions.” That truly is staggering. Five words calmed my soul, got rid of the knots, stopped the roller coaster, leveled out the hills and valleys, and reminded me that Jesus is truth. Not just true, but truth. The truth. This chapter is so rich. There’s so much more, but we’d be here for days. < Previous He is abundant. Reflecting on a year after death. Next > Merely buzz words? No way. Yes, and it’s so beautiful to know that faith is a gift of grace. Amen! It’s beautiful to me to know that God is the one keeping me saved. Praise God it’s not up to me! Yes! The fact that He is the Author and finisher of our faith is awesome!!!! Alexis, thank you for sharing your story with me. I’m humbled by your words. My heart is heavy with you, but so thankful for the work God is doing. He’s carrying us both. I’m going to send you a email with my contact information so we can talk further if you want. I’ll be praying for you as well! Also, I’d love to be able to connect you with a church in the Richmond area if you need one. I’m from Virginia and some of my family is still there. My sister goes to The Village Church at Midlothian. I’ll get you their info if you want. I know my church has been an indispensable part of my journey. They have carried alot of the burden with me. And they have pointed me to truth when I haven’t been able to do it myself. I have some other resources that God has really used in my heart as well. I’ll share them with you. Know this, you are loved. Jesus died for sinners like you and me. And eternal life is a free gift. It’s as easy as “if you confess with your mouth that Jesus is Lord and believe in your heart that God raised him from the dead you will be saved.” (Romans 10:9-10) What marvelous, wonderful truth. For the believer in Jesus, though friends and family desert us he never will. Praying, and I will be in touch. Thank you for referencing my blog in your post! I’m glad it was a blessing and encouragement to you.